The Cinque Terre secret is REALLY out. Not that Cinque Terre doesn’t deserve it – the collection of five tiny towns, clinging to the vertiginous Ligurian coast like pastel-colored barnacles and connected by scenic paths that wind through olive and lemon groves high above the sparkling Mediterranean, is enchanting. But the towns’ charming small size also means that the tourism boom is making them bulge at the seams. Rick Steves, author of a widely-popular series of travel books (one I appreciate for its unpretentious criticism of tourist attractions and respectful travel philosophy) sent the northern Italian park to the top of every middle-aged tourist’s must-see list about ten years ago. Visiting Cinque Terre this past weekend, technically still the off-season, I was surprised to find hordes of them. 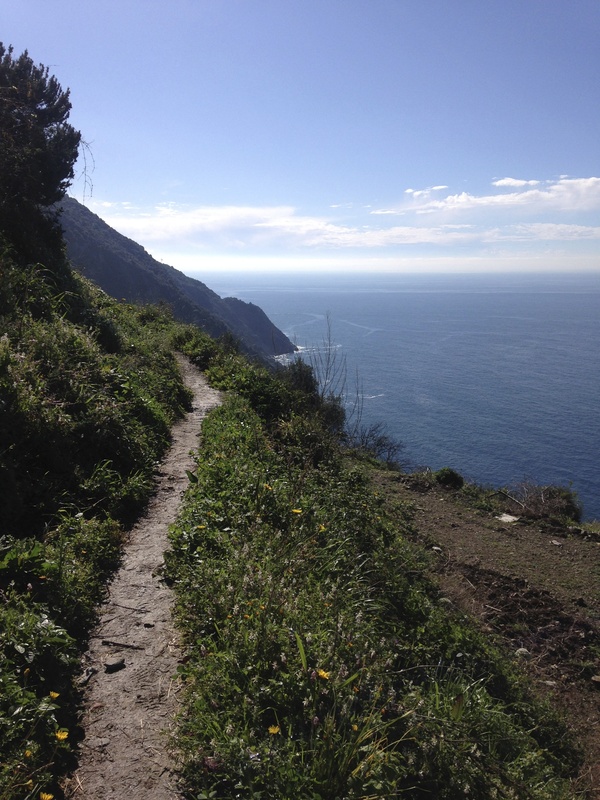 As an avid but crowd-averse hiker, I don’t like shuffling along a narrow trail packed with other humans, but with most of the famous five-town coastal trail closed for repairs, this is exactly what happens on the open portion between Monterosso and Vernazza. BUT– and I would probably keep my mouth shut if I thought more than about three people ever read this blog– one of the best stretches of coastal trail remains largely ignored by the masses. Part of the reason for this is that the trail head is not very close to the train station and the town is not technically part of the Cinque Terre national park, so lacks signage and publicity. 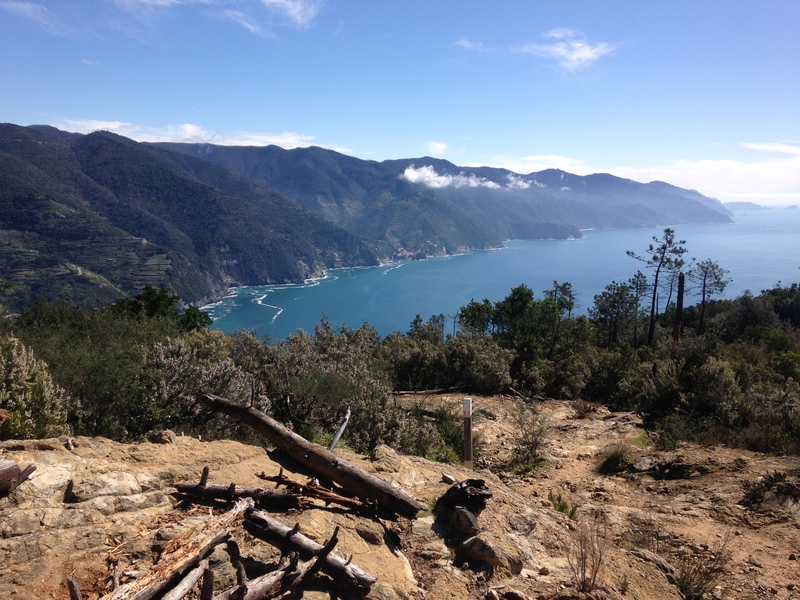 The segment runs from the larger town of Levanto to the first Cinque Terre village of Monterosso and offers a little more tranquility, plus awesome views and a variety of interesting terrain as it winds through farmland, shady forest, and along sunny flowered ridges. It’s just as beautiful as the path between Monterosso and Vernazza (due to unlucky timing, despite having been to Cinque Terre twice I haven’t been able to check out the other three coastal path segments because of maintenance and flooding problems) and the soundtrack consists of the distant surf, birdsong, and breezes, which is far superior to snatches of strangers’ conversations (like one gem I heard on the trail entering Vernazza: “DAD, if it’s OVER that hill I swear to GOD I’m not going”) and my own voice greeting, thanking, and apologizing to other hikers. I’m hopeful that Levanto’s relative inconvenience and lack of glamour will continue to attract only the intrepid, but not even the most obnoxious fellow tourist can make the fragrant air, which smells of earth, spices, flowers, and sea, any less intoxicating. It looks so beautiful! Part of me wants to go (my mother’s name is Vernazza and her Italian family is from Verazze), but the other part of me remembers that my idea of hiking more closely resembles strolling. How did you get there? Would I be wrong if I said it seems like you’re in a new country every month? You’re such a travel goddess. It is beautiful! 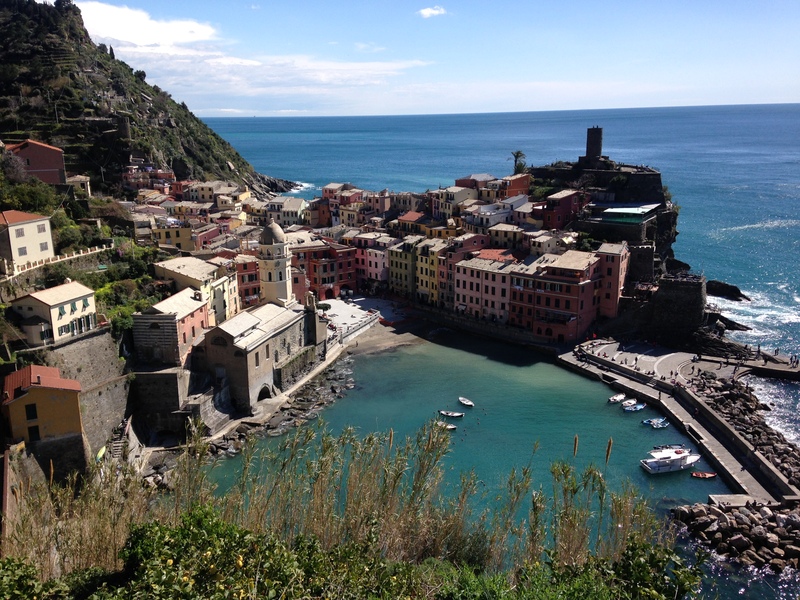 We took the long, cheap way – IDBus to Milan, then a train to Riomaggiore. On the way back we just took the train which was much shorter and less expensive on the return. Also, you can go and just stroll – there’s a train that runs between all the towns! There’s a little climbing, but it’s not very rugged! You’d be fine in regular sneakers or even tennis shoes. Am now concerned because I don’t know the difference between sneakers and tennis shoes. Maybe there isn’t one? For some reason in my head a tennis shoe is like a flat rubber-soled shoe, and a sneaker is the more elaborate running-type shoe. I might have made it up…?